This work package employs multi-scale systems modelling, using spatial and temporal information relevant to the UK, to explore the nature of future hydrogen systems, the potential roles of different technologies and their performance targets. These models take account of the diverse set of options at each stage of the system (as shown in Figure 2.8). The work seeks to support decision making related to questions such as: (i) under what conditions (technical and otherwise) can we expect to see a large scale infrastructural system based on the generation and use of H2 in the UK? (ii) What are the optimal system configurations under different conditions (if H2 has a strong role to play in energy supply and demand balancing vs if H2 has a strong role to play in transport); (iii) what performance measures arise at the system level if improvements in individual technologies (conversion, storage, use) are made, and hence what improvements should be targeted for components for them to become relevant at the system level? This work is conducted through Collaboration between Imperial Centre for Process Systems Engineering and UCL’s Energy Institute, as well as Collaboration with a number of European partners in the field of joint H2-CCS infrastructure design. 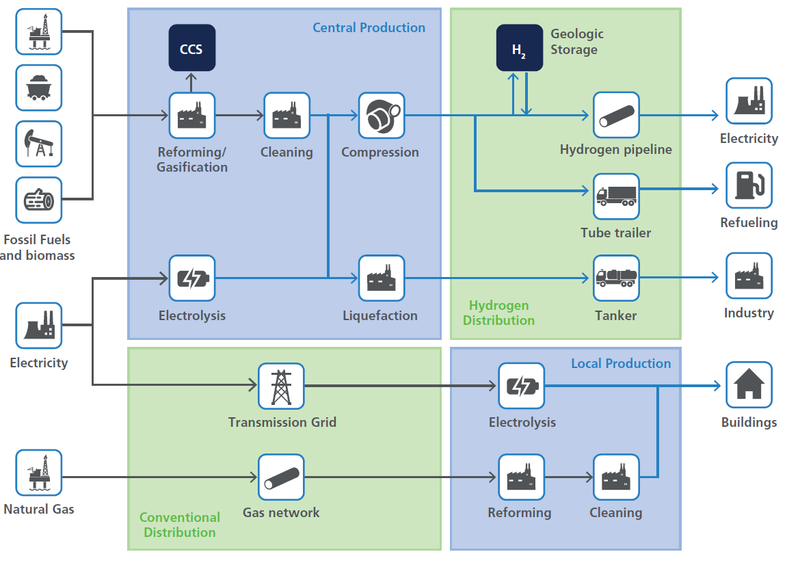 Hydrogen delivery pathways. This diagram is simplified and non-exhaustive, and serves to highlight the diversity of options at each stage of the system. H2FC Supergen Energy Systems White Paper, Figure 6.1.5 Ref: Chapter 6: D. Scamman, P. Dodds, P. Agnolucci and L. Papageorgiou (2017) Hydrogen Infrastructure. I. Staffell and P.E. Dodds. (Eds.) (2017) In The role of hydrogen and fuel cells in future energy systems. H2FC SUPERGEN, London, UK.